Sugared cranberries. Great for decorating desserts like cakes, baking in goods like holiday cookies or simply as a sweet snack! So. As I’ve previously mentioned, I’m not a huge fan of regular cranberries. Usually they are too sour for my liking, even when prepared in other dishes. That’s why I made a sweeter version of cranberry sauce with fruit juice and honey. I must be behind the times, because I only recently heard of sugared cranberries. Typically they are used for extra decoration for cakes and the like, and the first I saw them they looked almost too pretty to eat! 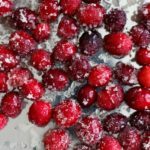 If you want to use them as display for another dessert, you’ll need to have a little more patience than me – I got too excited to make the next recipe that features these cranberries and started to rush through the sugar coat application. Also, I tried to make these “healthier” by cutting the sugar down from what I have seen. These still have a slight tang to them so if you like sweet & sour things, you’ll love these! First you want to make some simple syrup. Basic simple syrup is 1 part water to 1 part sugar. I chose to do a “thin” simple syrup (3 parts water to 1 part sugar) or 1 and 1/2 cups water and 1/2 cup sugar. It definitely keeps a little bit more of the tang by diluting it a bit. Boil that for a few minutes and then remove from heat once the sugar is dissolved. 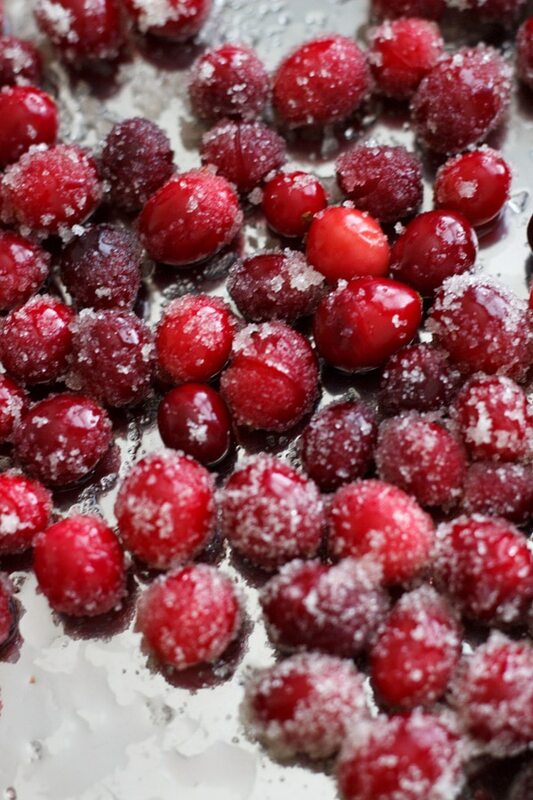 Let it cool before putting the cranberries in – otherwise you’ll end up with cranberry sauce! Here’s where I’ve seen different methods. You can let the cranberries sit in the sugar water for anywhere from an hour to overnight in the refrigerator. However much time you have. After the cranberries have soaked in the sugar water, drain (don’t rinse), spread out on a tray or parchment paper, and let dry for an hour. Now time for the hands-on (i.e. fun) part – roll them in some more sugar! This is where I got impatient – and why the sugar isn’t exactly evenly distributed on the ones in this picture. Oh well – still delicious! Sugared cranberries. Great for decorating desserts or a sweet snack! To make the light simple syrup, add water and sugar to a pot and boil for a few minutes, stirring until sugar dissolves. Remove from heat. After syrup cools slightly, add the package of cranberries. 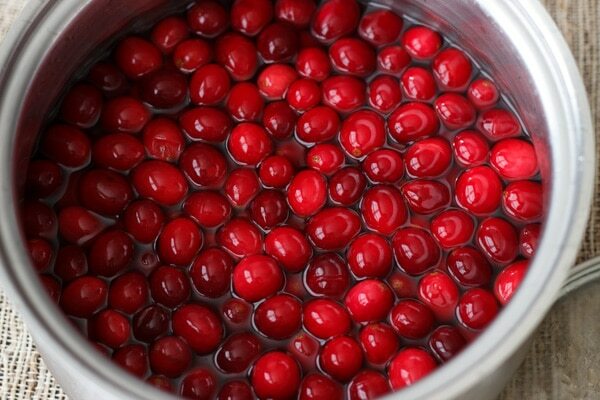 Refrigerate overnight, letting cranberries marinate in the sugar water. 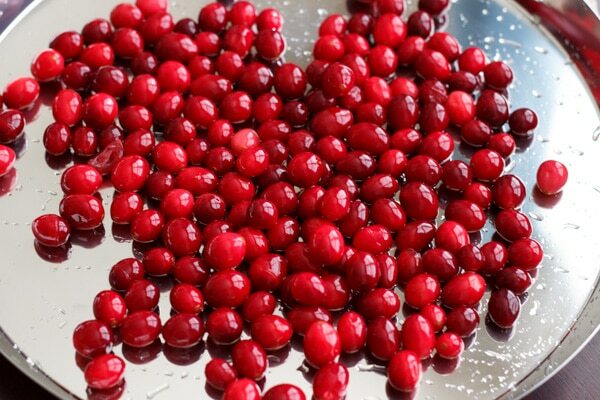 Drain (don't rinse) cranberries and allow to dry on cookie sheet or parchment paper for about an hour. Add remaining 1/2 cup sugar to a bowl. 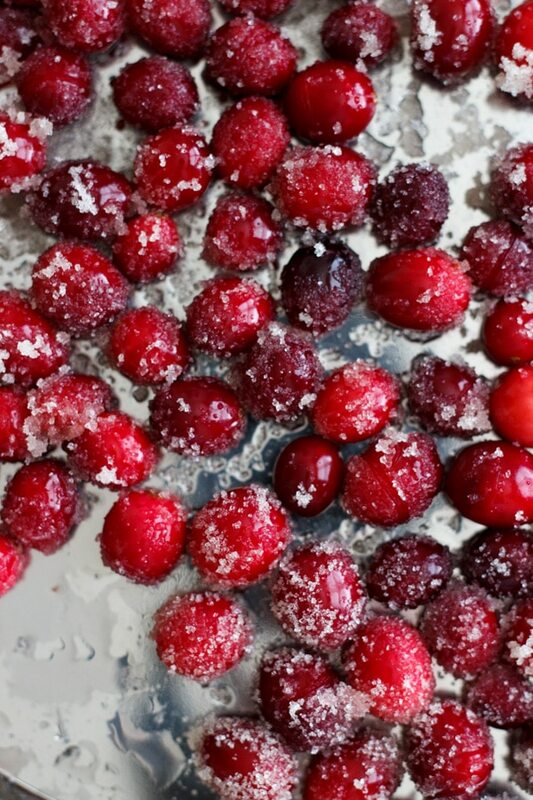 Roll cranberries through sugar to throughly coat, and place back on tray to dry for a bit more, at least 20 minutes. This looks so amazing! This would look so cute on vanilla cupcakes or maybe in a Christmas punch! Oo Christmas punch, great idea Julie! Same here! The sugar definitely cuts the tang. It’s not totally sweet – some of the tang still comes through. But I liked them (especially in other desserts) and I’m a hard-pleaser when it comes to cranberries!